The 58km Manchester Ship Canal is one of the most important civil engineering projects of the late Victorian era. It was built to reduce the time and the costs associated with transporting goods between Manchester and Liverpool by road and rail. Sea-going ships could now move from the Mersey estuary right into the centre of Manchester. For most of its route, the ship canal's navigation channel is 36.6m wide and 8.5m deep. The five sets of locks along its length rise a total of 17.2m. From Eastham on Merseyside the canal follows the southern edge of the estuary, passing Frodsham, joins the River Weaver and the Weaver Navigation and passes Runcorn. It flows south of Warrington and through locks near Thelwall and Irlam, continuing through Barton Locks to a final lock near Salford Docks and on to Pamona Docks in Manchester. The construction cost was more than £15m and the task required the excavation of 41.3 million cubic metres of earth and rock. A variety of mechanical plant was used during construction, including 58 steam ‘navvies’ (excavators), 124 steam cranes, seven earth dredgers, 173 locomotives and 6,300 railway wagons. The project employed 17,000 people at its peak. Many of the existing railway bridges had to be reconstructed or raised to allow large ships to pass. 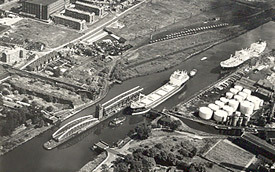 The Bridgewater Canal meets the ship canal at Salford and the Barton Swing Aqueduct was constructed to carry over the new waterway. Similarly, the Swing Road Bridge carries the road over the new canal and is located immediately adjacent to the aqueduct. Both Barton Road Bridge and Trafford Road Bridge swing hydraulically. Later, three further bridges were constructed — Barton High Level Bridge (1960) carrying the M60, Thelwall Viaduct (north-bound bridge opened 1963) carrying the M6 and the Widnes-Runcorn Link Bridge (1956-61). The engineer for the ship canal and its locks, bridges and swing aqueduct was Edward Leader Williams. James Abernethy had been asked to report on the various proposals for the project and had favoured Leader's scheme. Abernethy was then appointed consulting engineer and he regularly visited the construction sites. William Hunter was the design engineer. Salford Docks closed in the 1970s and have now been redeveloped as Salford Quays for residential and leisure uses. Manchester Ship Canal is now part of the Peel Ports Group. Some 8m tonnes of cargo is transported along it annually. In 2007, a shuttle barge service began for moving containers between Liverpool and Irlam as an alternative to road transport.